I added one additional long position to the portfolio. At this point, I don't want to force any new trades and will have to wait for just the right opportunity to add anything new, as the bounce in equities is starting to mature some. Volatility Index (VIX) - Finished the day surprisingly higher. A push below 20 would help ease the volatility fears of traders. T2108 (% of stocks trading above their 40-day moving average): Another strong day, with a 45% move that took it up to 30% overall. A lot of momentum has emerged in this market, but the question is how long can it be sustained for? Moving averages (SPX): Huge day yesterday, as SPX managed to close above the 20-day moving average for the first time since 12/3. The 50-day MA is next and will represent a far bigger challenge. Discretionary and Technology continues to be the sectors that investors are flocking to. Stay away from the Utilities and Staples until this bounce wears off. Respectable rally yesterday, though it did lose some steam in the afternoon. 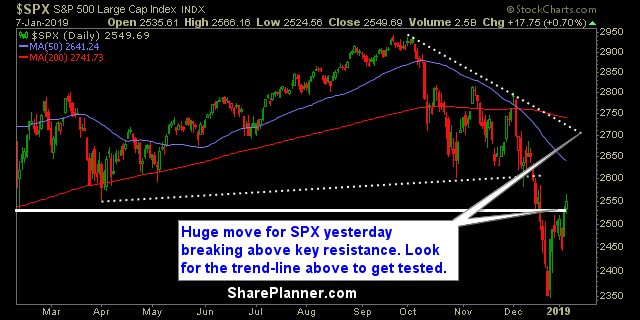 The key is that it broke above major resistance, shown below, and looks to be heading for a retest of the downtrend line.